I enjoyed the freedom of projects that allowed you to design whatever you wanted, and the help and support I got from my tutor was great. 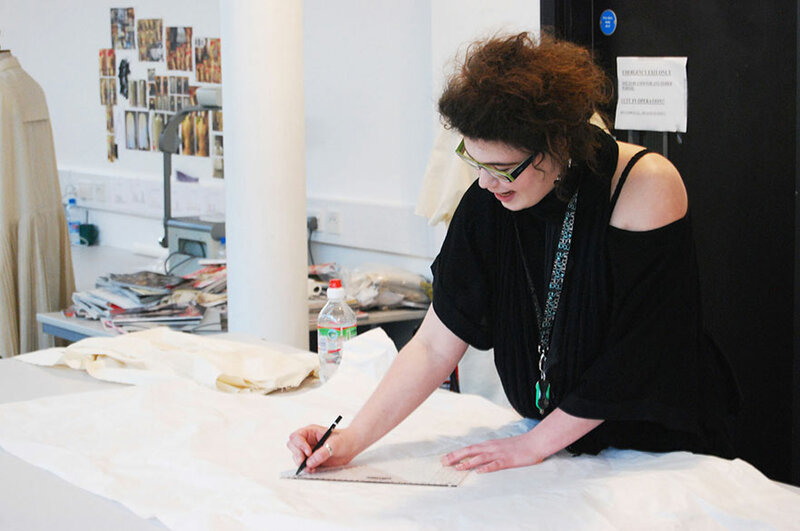 Laura studied her undergraduate degree at NTU, completing BA (Hons) Fashion Design. She chose this course to build on her pattern cutting skills and to understand how to turn more complex designs into 3D garments. Laura is progressing on to our MA Fashion Design following her completion of this course. "I enjoyed the freedom of projects that allowed you to design whatever you wanted, and the help and support I got from my tutor was great and helped me immensely. The strength of the course is the variety of different projects, from designing what you want to recreating garments by existing designers. "NTU has great facilities. There is lots of table space in the MA studio for sketchbook work and pattern cutting, tailoring dummies to work on and reliable industrial machines. As a design student you find yourself needing to use Photoshop, Illustrator and other CAD software and NTU provide the latest versions of these. "I would recommend this course based on the facilities available, the contacts NTU has with industry and the level of help you receive from academic staff. I also think the environment is great; being able to work together in the MA studio brings everyone together and you meet people from all over the world."